The Summer School is pleased to have Lev Manovich give the opening keynote on Monday, 29 June. We are also happy to welcome Limor Shifman as a keynote speaker. Both have done extensive research on the political uses of so-called secondary social media, especially Instagram as well as Tumblr. This year's Digital Methods Summer School is devoted to what we call post-Snowden media empiricism and 'secondary social media. Post-Snowden media empiricism refers to how to study online media since the revelations in June 2013 about the breadth and scope of NSA surveillance activities. Writing about the future of media theory, post-Snowden, scholars are closing the age of Internet innocence. For years one would study the extent to which cyberspace is an alternative space, a realm of new politics, corporealities and identity play, cleared of reputation, institutions and regulatory legal regimes. Such a point of departure is long dated, but the post-Snowden dates others too. The likely exception is surveillance studies, once a branch or sub-field. Such is the context these days for calls for 'post-media' as well as 'post-digital' studies. What does it mean for media researchers to treat and study empirically the web as an intelligence medium? Do we hunt for confidential documents and study leaks? Would we inevitably slope towards intelligence work? In post-Snowden media empiricism, would one embrace the study of the dark web, 'anonymous', onion routers and such? Should we throw a Tor install party? Ghostery and other software that tracks trackers (like our very own  tracker tracker tool) are means to study soft surveillance online (third party cookies, beacons, etc.). Does such surveillance study pale in the face of the sheer scale of post-Snowden media? With the cloud we have moved from a user logic of downloading to one of uploading. Should we replace our scrapers with sniffers? Do the older new media methods still apply? Could we map the cloud as linked server space? The NSA did not name all the social media platforms. 'Secondary social media' is a term we are using to compliment and place opposite to GAFA (Google, Apple, Facebook, Amazon), employed increasingly in French intellectual circles to denote U.S. digital cultural imperialism. What value do the other social media platforms have for social research? If Google can be shown to author new source epistemologies, Apple's iOS store (together with Amazon's lists) as sources for best-selling issues and Facebook for most engaged with content, what do secondary social media such as Instagram, Pinterest and Tumblr have to offer? We are also interested in social media alternatives and new online spaces offering conviviality without necessarily resorting to the logic of the social graph. Among the big data critiques is the notion of ready-made data. This line of thought is part of the continuum which sees a wholesale switch from hermeneutics to pattern-recognition as well as a reputational swing favouring those with big analytical infrastructure. But there needs to be data for the machines that learn and the analysts who run them. Ready-made data as a big data critique refers to an over reliance on API streams for the study of virtually any societal matter, such as Twitter data to monitor disasters, revolutions and presidential transitions and predict flu trends, elections as well as celebrity awards. Which data are preferred? 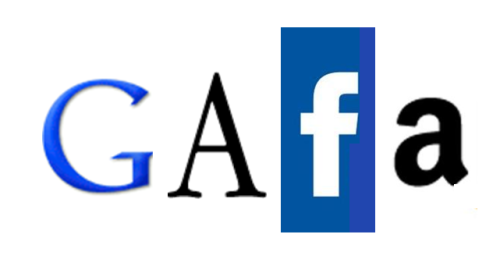 Whilst the term has deeper roots in the consideration of publishing old media online, the acronym, GAFA, standing for Google, Apple, Facebook, Amazon, has resonated particularly in the French press and scientific literature as the new term for U.S. digital cultural imperialism, expanded from allusions to Googlization nearly a decade ago, which also coincided with a call for a European search engine, Quaero. Whilst the term may fit well for media publishers and advertisers, for data analysts Twitter is an obvious addition for the study of influence and trend as would be Wikipedia, not only for monitoring attention to matters of concern and cross-cultural comparison but also for data groundwork such as keyword and source list-building (with the advantage or disadvantage of often being exhaustive such as the list of social networking websites). As a counter-point to GAFA, and the study of big platforms, we would like to introduce the notion of secondary social media, with the question, where are the other signals (online) for the potential purposes of social research? And do they tend to be studied in a similar fashion as the big platforms (monitoring and prediction)? How else to study them? When one queries new trending social media networks, most popular social media sites for teens or other auto-suggested and completed key phrases in leading search engines, the lists may be concatenated (the exhaustive approach) or triangulated, serving up LinkedIn, Pinterest, Instagram, Tumblr, Flickr, Vine, Meetup, and other platforms but also the after Facebook messaging applications such as Snapchat. How to study the other social media? The first recognition is that secondary social media is meant as a term in a research sense rather than one pursued from a political economy point of view. We realise that Vine is owned by Twitter, Flickr by Yahoo, Instagram by Facebook, meaning that they are already GAFA-like, and rising on (potential) market capitalization lists. They are understudied, however, both generally but also in terms of how they may be repurposed for social research, which is the digital methods approach. Secondary social media have specificities as well as similiarities to Twitter and Facebook, which may makes methods of their study comparable. Instagram selfies (including their locations and characteristics) have seen scholarly attention as has (gendered) social curation on Pinterest. But one may make use of the content tagging and activity on the platformed social media so as to study issue engagement. Instagram has hashtags (and comments), and Pinterest likes, repins and comments, organising content and metrified attention to it in ways similar to Twitter and Facebook, where one routinely studies most engaged with content (through the likes, shares, comments, liked comments on Facebook pages and groups, and retweets and favorites on Twitter), often finding content with characteristics consistent with memes. With its reblogging feature, Tumblr is similar, as potentially are its modes of analysis. Indeed, there may be a temptation to reduce all social media analysis with digital methods to the study of network metrics, particuarly through inquiries into influence, be it of an individual (clout) or a subject matter (trend). The ease with which data can be collected from such platform APIs as Twitter, and poured into analytics buckets attests to the admonition. As an analytical strategy, however, one also may prefer the specificities of the platform over the typical metrics measures. On the list are mature platforms such as Flickr, where one typically studies taggings new taxonomies, or more specifically the social life tags, watching which pictures most significantly occupy the politics tag over time, for example. There is LinkedIn, which one can study the (new) skill sets of professions, profiling the new job names and activities in the emerging creative industries. Snapchat to date has had little scholarship or attention paid to its analytics, apart from a security breach into its unauthorised API, thus far defying repurposing. When is a platform less suitable or even useless for repurposing for social research? Such could also fill in the notion of secondary social media. Issue Mapping for an Ageing Europe is a seminal guide to mapping social and political issues with digital methods. The issue at stake concerns the imminent crisis of an ageing Europe and its impact on the contemporary welfare state. The book brings together three leading approaches to issue mapping: Bruno Latour's social cartography, Ulrich Beck's risk cartography and Jeremy Crampton's critical neo-cartography. These modes of inquiry are put into practice with digital methods for mapping the ageing agenda, including debates surrounding so-called 'old age', cultural philosophies of ageing, itinerant care workers, not to mention European anti-ageing cuisine. Issue Mapping for an Ageing Europe addresses an urgent social issue with new media research tools. Richard Rogers, is professor of new media and digital culture at the University of Amsterdam. Natalia Sánchez Querubín, is PhD candidate in new media at the University of Amsterdam. Aleksandra Kil, is PhD candidate in cultural studies at the University of Wroclaw, Poland. You are also cordially invited to the UvA Summer School welcoming event to be held on Wednesday 8 July, 18.00hrs, with drinks and dinner. See the invitation to the event. Digital methods is a term coined as a counter-point to virtual methods, which typically digitize existing methods and port them onto the Web. Digital methods, contrariwise, seek to learn from the methods built into the dominant devices online, and repurpose them for social and cultural research. That is, the challenge is to study both the info-web as well as the social web with the tools that organize them. There is a general protocol to digital methods. At the outset stock is taken of the natively digital objects that are available (links, tags, threads, etc.) and how devices such as search engines make use of them. Can the device techniques be repurposed, for example by remixing the digital objects they take as inputs? Once findings are made with online data, where to ground them? Is the baseline still the offline, or are findings to be grounded in more online data? There is also a Digital Methods book (MIT Press, 2013) as well as a complementary Issue Mapping book (Amsterdam University Press, 2015). 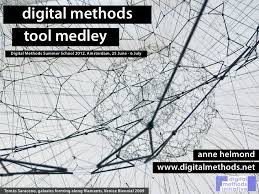 The Digital Methods Summer School, founded in 2007 together with the Digital Methods Initiative, is directed by Professor Richard Rogers, Chair in New Media & Digital Culture at the University of Amsterdam. The Summer School is one training opportunity provided by the Digital Methods Initiative (DMI). DMI also has a Winter School, which includes a mini-conference, where papers are presented and responded to. Winter School papers are often the result of Summer School projects. The Summer School is coordinated by two PhD candidates in New Media at the University of Amsterdam, or affiliates. This year the coordinators are to be announced. The Summer School has a technical staff as well as a design staff, drawn from the ranks of Density Design in Milan. The Summer School also relies on a technical infrastructure of some nine servers hosting tools and storing data. In a culture of experimentation and skill-sharing, participants bring their laptops, learn method, undertake research projects, make reports, tools and graphics and write them up on the Digital Methods wiki. The Summer School concludes with final presentations. Often there are guests from non-governmental or other organizations who present their issues. For instance, Women on Waves came along during the 2010, Fair Phone to the 2012 Summer School and Greenpeace and their Gezi Park project in 2013. We worked on the issue of rewilding with NGOs in the 2014 Summer School. Digital Methods people are currently interning at major NGOs and international organizations. Previous Digital Methods Summer Schools, 2007-2014, https://wiki.digitalmethods.net/Dmi/DmiSummerSchool. See also previous Digital Methods Winter Schools, 2009-2015, https://wiki.digitalmethods.net/Dmi/WinterSchool. What's it like? Digital Methods Summer School flickr stream 2012 and flickr stream 2013. There is also a 2015 flickr collection. The Digital Methods Initiative was founded with a grant from the Mondriaan Foundation, and the Summer School has been supported by the Center for Creation, Content and Technology (CCCT), University of Amsterdam, organized by the Faculty of Science with sponsorship from Platform Beta. It also receives support from the Citizen Data Lab, Amsterdam University of Applied Sciences. The Digital Methods Summer School is self-sustaining. 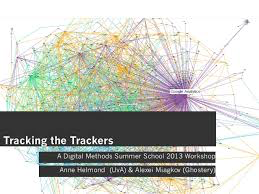 To apply for the Digital Methods Summer School 2015, please use the University of Amsterdam Summer School form. Or, please send a one-page letter explaining how digital methods training would benefit your current work, and also enclose a CV, a copy of your passport (details page only), a headshot photo as well as a 100-word bio. Mark your application "DMI Training Certificate Program," and send to info [at] digitalmethods.net. Please also mention in your application e-mail whether you'd like to make use of the accommodation service (for more information see below "Housing and Accomodation"). The early bird deadline for applications for the Summer School is 23 April 2015. Early bird notifications will be sent on 24 April. The regular deadline for Summer School applications is 7 May. Notifications will be sent on 8 May. Any questions may be addressed to the Summer School coordinators, Saskia Kok and Richard Rogers, info [at] digitalmethods.net. Informal queries may be sent to the email address as well. The Summer School costs EUR 595 (non-credits) or EUR 895 with credits (6 ECTS). Accepted applicants will be informed of the bank transfer details upon notice of acceptance to the Summer School on 24 April 2015 (for early birds) and 7 May (for all remaining participants). The fee must be paid by 24 May 2015 (for early birds) and 7 June (for all remaining participants). University of Amsterdam students and Research Masters students in the Netherlands who are members NICA or RMeS should state on the application form that they wish to apply for a fee waiver. The Digital Methods Summer School is part of the University of Amsterdam Summer School programme, which has a video giving a flavor of the Summer School experience. Students from universities in the LERU and U21 networks are eligible for a scholarship to help cover the cost for tuition and housing for the DMI Summer School. Please consult their websites in order to see whether you are eligible for a scholarship and to begin the application procedure. The Summer School is self-catered, and there are abundant cafes and a university mensa nearby. The Digital Methods Summer School is located in the heart of Amsterdam. There are limited accommodations available to participants at The Student Hotel at reasonable rates. In your application please indicate whether you are interested in making use of this service. In your acceptance notification, you will be given information about the reservation as well as payment. For those who prefer other accommodations, we suggest airbnb or similar. For shorter stay, there is Hotel Le Coin, where you may request a university discount. 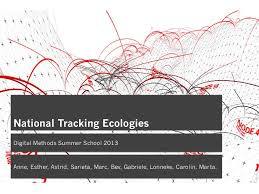 For those following the Digital Methods Summer School for credit, 6 credits (ECTS) are granted to participants who follow the Summer School program, and complete a significant contribution to a Summer School project (evidenced by co-authorship of the project report as well as final (joint) presentation). Templates for the project report as well as for the presentation slides are supplied. 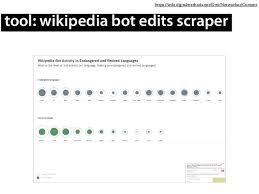 For previous Summer School projects, see for example https://wiki.digitalmethods.net/Dmi/WikipediaAsASpaceOfControversy. The Summer School meets every weekday. Please bring your laptop. We will provide abundant connectivity. We start generally at 9:30 in the morning, and end around 5:30. There are morning talks one to two days per week. On the last Friday we have a boat trip on the canals of Amsterdam. For your Summer School to be especially successful we would recommend highly that you watch (or listen to) the Digital Methods tutorials. Audio and Video Tutorials - Digital Methods researchers have given tutorials and talks which are useful and sometimes even entertaining. Summer School Reader and Homework - Compilation of relevant readings and other preparatory materials. We shall have a list of summer school participants and make an old-fashioned Facebook with the headshots and bio's you send to us.